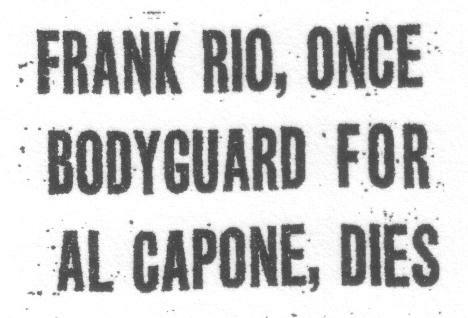 Frank Rio, Frankie Rio,Frank Kline/ Cline,Slippery Frank Rio,Frank Ross. The most recognizeable and loyal of Capone's bodyguards. Frank Rio is remembered in books for his loyalty towards his boss by supposedly once throwing Capone to the ground in the Hawthorne inn machinegun attack led by the fierce Northsider's Earl "Hymie" Weiss. Frank Rio is the one who also supposedly foiled the plot by Anselmi and Scalise who along with Joseph "Hoptoad" Giunta were secretly planning to depose Capone of his throne. No concrete evidence of any of this as research shows. Little was known about Rio until now. Let's take a look at this devoted Capone character. Only records found of father and mother were that they were probably from Oliveta Citra and not Luvito as stated in above death certificate.Death certificates at that time,especially in dealing with gangsters had misleading information. Frank may have been born in Chicago or came into the country under a different name as no records fitting his I.D. were found.Also his age fluctuates a couple of years in almost every arrest. 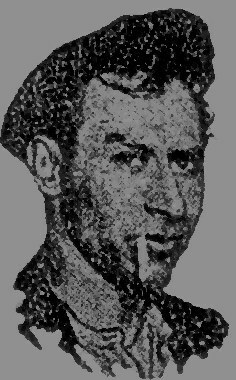 Frank Rio first hit the newspapers in 1918 and was described as a husband who was a cheapskate.It was mentioned that he occasionally handed his wife Anna a dollar from time to time and sometimes grudgingly gave her an extra quarter.This lead her to ask for seperate maintenance from him (separation). This was listed in the newspaper under the heading Camouflage which was a revealing look at Chicago's different marital problems. Rio's was the least severe as others listed there threatened to kill their wives. Frank Rio was first described as a robber,burglar,jewel thief and auto thief. In 1918 he is arrested various times in connection with different holdups. Sept.1918 he is arrested with co-hort CarmenTaglia.They are suspected in complicity with others as holding up the Argo and Proviso state bank in Maywood thus relieving the bank of $45,000 in cash and liberty bonds.The stick-up men were found to be merely boys.They were identified by a witness through one of the robbers bad habit of non stop cussing. On November 10,1919 Slippery Frank Rio who already eight indictments for previous crimes was again arrested at the rear of Joseph W. Klein's fur shop at 5107 South Michigan avenue. He was out on $43,500 bonds while caught by policemen loading stolen furs into a stolen vehicle.Rio at the time was known as one of Chicago's most successful and dangerous automobile thieves and burgulars.The underworld dubbed him Slippery for his knack at evading trial. On January 17,1921 a mail robbery occurs at the Union Station. Bonds totaling $482,000 were taken. Robert O'Neill, Frank Rio and Thomas Dyer were picked up by authorities and indicted for possession of $40,000 of bonds identified as part of the Union Station mail robbery. Slippery once again charges are eventually dropped.Public outcry finds collusion between criminals and judges. Judges reduce bails that were fixed at certain amounts.Rio finds his freedom often. Rio in front of the judge. The Capone mob takes notice of the fiesty gangster. Al Capone takes a shining to Rio whom he uses as a sounding board and uses to obtain opinions. He is loyal to Capone because Capone is a loyal boss who pays well. Another good reason is that Capone immediately kills if crossed. Rio is said to guard over the boss and take care of his whims. Supposedly saves Capone in the Hawthorne attack. Frank Rio is instrumental in uncovering a plot against the boss by his so called loyal henchmen.Alberto Anselmi, John Scalise and Joesph Giunta. Rio is supposed to have been one of the trio's executioners that evening. Frank Rio's mugshot in Philadelphia. 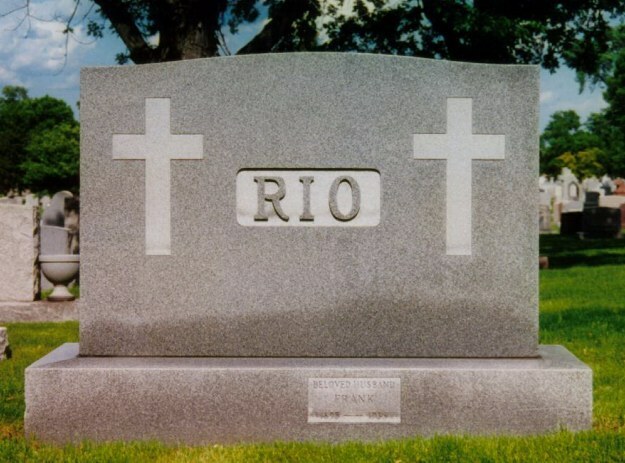 Most people know that Rio does time with Al in Philadelphia's penitentiary in 1929. This movie theater arrest is said to have been set up with the possible help of Philadelphia's own Max "boo boo" Hoff. Through this Capone appeases the mob syndicate and evades any retaliation from rival gangs.Capone constantly dispells this in newspapers.States he doesn't run from anyone.During all this prison time Frank Rio's cell is right next to his boss. Once released and back in Chicago,Capone parties as the government starts piling it's tax case against big Al. November 13,1930, Frank Rio, along with Claude Maddox is paraded in front of the well known Judge Lyle for vagrancy. The baliff tells the charged to line up so they can have a better look at them. All obey with the exception of Rio who tells the baliff to go to hell. Baliff Townshend turns around and slaps Rio in the face. Rio responds with further profanity. Judge Lyle adds six months to Rio's bad behaviour unless he apologizes to the baliff. Rio understands that Al's time is coming up. Al prepares to relax in Florida by having light tailored suits made. Rio makes the statement that he should have stripes put on because he is going to prison. "The hell I am!" Al retorts. There is talk amongst the Capone underlings to know who will replace Al upon his conviction. Many of Capone's higher ups want change in direction anddo not want Rio to step into Al's shoes. Known like McGurn as one of Capone's golden boys, he is said to have not much leadership experience and also for having become soft from the high living he had enjoyed with Al. While Al and his lawyers prepare to do battle with the government, Rio keeps busy by dabbling in beer peddling and later having a hand in the cleaners protection racket. After Al is convicted and sent off to the big house it is apparent that Rio is overlooked as candidate for Capone's job. Intersquabble between Humphreys, Nitti, Newberry are qualmed when Nitti is thrust up to the job of gang overlord. 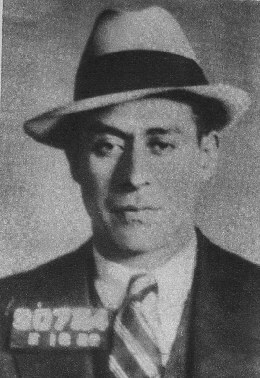 Nitti is known as a mob man who worked out in the field of gangland and knew the ropes well.Besides, Nitti had the job of taking care of business whenever Capone left town. He was already used to it and so the choice was an obvious one as he was also probably chosen by Capone. Once Nitti finishes his sentence in prison, he will take over Al's job as successor. 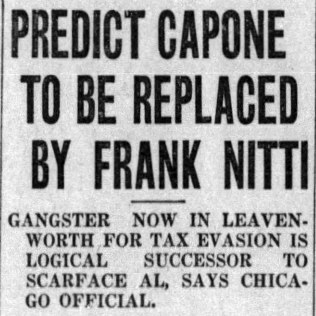 October 30, 1931, Newspaper headline predicting Nitti to take Capone's place as chief. In 1932, the Capone mob sends Frank Rio over to the Lindbergh family in New Jersey to offer Capone's help in finding their kidnapped baby. Under the assumed name of Frank Ross he is turned down and sent to A.P. 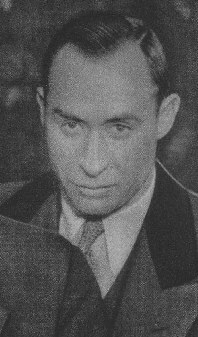 Madden head of the intelligence unit.Charles Lindbergh refuses to have any dealings with criminals, even if it may help find his baby. Rio continued in the Capone mob,but was beginning to fade away in the background. His health was beginning to deteriorate. He was suffering from heart disease.It began to slow him down severely causing shortness of breath and weakness. He stayed out of the limelight for two years, mostly at home with his wife and two adopted children (Lawrence 13 years old and Lorraine 2) at 1000 Belleforte Avenue in Oak Park. On february 23,1935 Frank Rio succumbed to the disease in his home. The body was removed by gang associates and brought to Rago's undertaking parlor at 624 North Western avenue. Al Capone is devastated upon hearing the news of his pal passing away. From his cell in Alcatraz He writes the following excerpt in a letter to his wife. To my dear Wife: Hello Ma,how are you, and how is our dear Son. Sure hope and pray that you both are well, after all this sad news about my dear Pal Frank. Gee, Ma, I sure felt terrible about it, to think him above all, and just at a time when he was just about to get somewheres, with his dear wife and two kds, God, honey. It was awful, and I sure felt awful about It, but honey, I guess it was the will of God, and all we can do is take care of his family and pray for him. So please tell Ralph that from now on and until I die I want him to arrange with the office at home to see that Blanch gets fifty dollars $50.00 every week, and fifty more for each of his children, and the money for the kids to be put In a trust fund and not to be touched until the kids ere twenty one years of age. And honey, I want you at times to keep in touch with her, and do all you can, also ask Ralph how sure he is that It was heart trouble as honey, you know Frank was at all times real healthy and strong and really I cant understand It and for Ralph to find out and you let me know. Honey, you also did right by leaving home and doing what you did with Blanch and also about flowers, now then honey, all I can say is 1 will always say a prayer for him, as he sure was a real pal to me. (Alphonse Capone March 3, 1935). Oak park police were at a loss in understanding why a natural death caused Rio's buddy gang members to take matters in their own hand in transporting his body to Rago's instead of calling the proper authorities. It is believed Rio had many interests in Cafes,Nighclubs and gambling houses. It was assumed that gang members wanted to divvy up Rio's gang owned assets before news of his death hit the newspapers. This action was a violation of an ordinance which requires notice of intention to move a body. As with most recognized gangster Rio's body was not permitted in church so a priest said a few prayers over his body in the undertaking rooms at 624 North Western (Rago's). Three automobiles filled with flowers and several hundred more cars bearing mourners made up the cortege to Mount Carmel cemetary at Hillside. After the funeral John Malaro,29 years old and said to be cousin of Rio is arrested with John D'Arco. Shortly after the marriage Anna dies in a car crash on Dec.26,1936. There is a fight between Rios's family, Rio's wife's family members and Joseph Taskoski for the inheritance of her valuables estimated at $22,000 along with big amounts of jewelry. Taskoski claims he is visited by Anna's family along with some hoods and told he will get nothing.He is forced to sign papers.